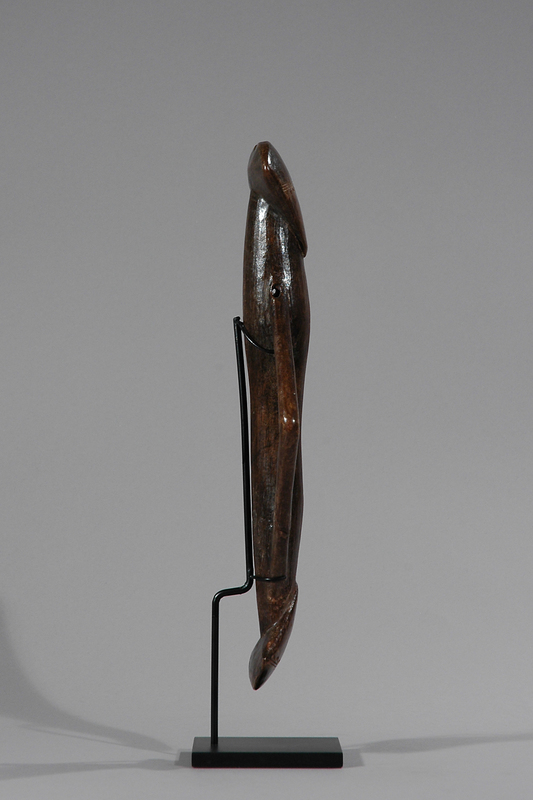 Bwa, Musical Instrument, Flute, Bwa, Burkina Faso. In Burkina Faso, flutes from the Mossi, Lobi and Bwa people are played to accompany blazons and drums during ceremonies and mask performances. They can be played singly or in groups. A flute plays a set of notes with a complex but a very repetitive tune. 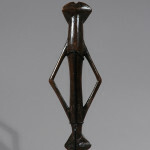 Flutes like this come in many sizes, but are of the same general structure with a human like form. One variation is the height and posture of the shoulders, which can be more raised or lowered. 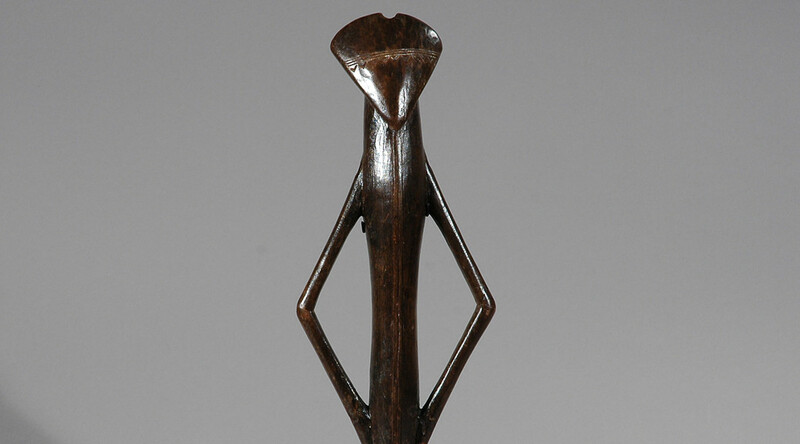 The instrument was used to accompany masked dances often in imitations of the tonal patterns of speech or song. 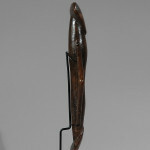 Some flutes were used for different purposes by hunters. 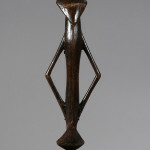 Bwa artisans typically use strong abstract shapes to portray people and animals on sacred objects. 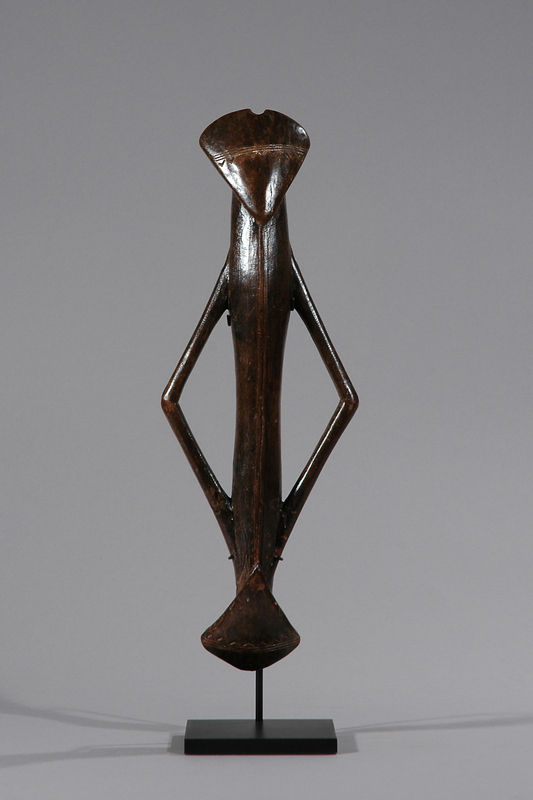 Though Bwa art is created primarily for ritual use, its aesthetic has been appreciated far beyond the West African villages where it originated. Its geometric design, for instance, is thought to have influenced Cubism in the early 1900s. The Bwa or Bwaba or Bobo-Wule (Bobo-Oule) people, are an ethnic group indigenous to central Burkina Faso and Mali. The Bwa lives in central Burkina Faso and southeast Mali, between Mali’s Bani River and the Mouhoun River (Black Volta) in Burkina Faso. Their population is approximately 300,000. They are known for their use of masks, made from leaves or wood, used in preformatively rituals. Like many of their neighbors, the Bwa are predominantly farmers, their main cash crop being cotton. They also farm millet, rice, sorghum, yams, and peanuts. Bwa villages are autonomous, and they do not recognize any outside political authority. They are led by a council of male elders who make all the major decisions. Villages are structured with a cluster of mud walled buildings around a central space where livestocks are guarded at night. 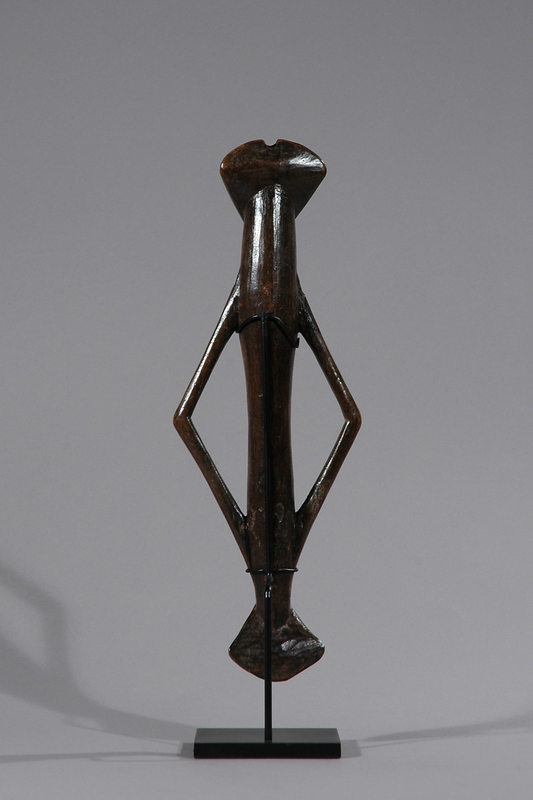 Literature: Marc Ginzberg ; African Forms, p. 144.